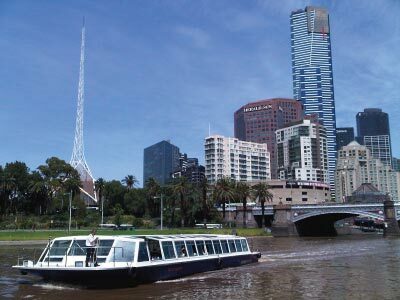 Melbourne Highlights afternoon tour takes in a cruise on the Yarra River followed by your coach tour through the sports, arts and entertainment regions, visits our Botanic Gardens and heads to the bayside area so you can sample the Melburnian lifestyle. Take a cruise along the Yarra River, relax and take in the scenic views before you join our afternoon Melbourne Highlights coach tour. Tour the highlights of Melbourne's CBD such as MCG and Melbourne Park. Stretch your legs at the Royal Botanic Gardens then head through Docklands waterfront, over Bolte Bridge and scenic drive along the bay of Port Melbourne to St Kilda and Brighton. Afternoon tea stop (own expense) in trendy Acland Street known for its patisseries and a photo stop at Brighton Beach bathing boxes. This tour gives you the opportunity to sample Melbourne life like a local. Pending tide conditions on the river, the cruise may need to go in the opposite direction which explores Melbourne's picturesque gardens, parklands and some of our famous sporting arenas.